The Easter date is Sunday March 31, 2013. The date on which Easter Sunday falls each year is based on the lunar (moon) cycles. 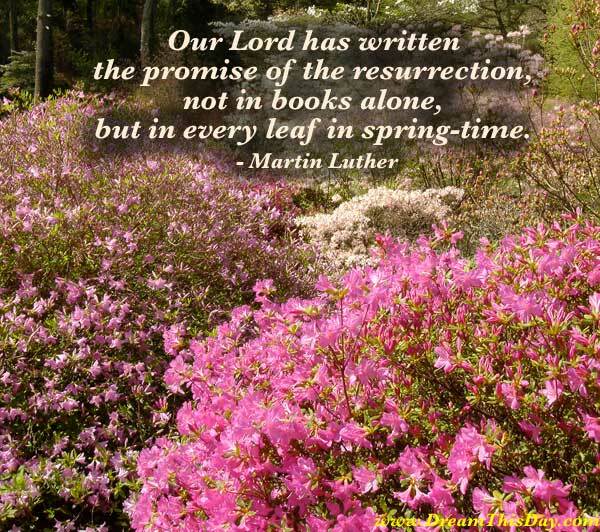 Enjoy these Easter quotes and greetings. Happy Easter! but has also spoken for us by his death. it was God saying to the world, "I love you. He who believes in Me, though he may die, he shall live. Easter says you can put truth in the grave but it won't stay there. how much more shall we be saved from God’s wrath through him.
" Love your neighbor and hate your enemy." to strength and beauty and happiness.
" Eye for eye, and tooth for tooth." and the opportunity to start over no matter what my circumstances. The joyful news that He is risen does not change the contemporary world. Still before us lie work, discipline, sacrifice. accept the discipline, and make the sacrifice. I say "Rejoice, He is risen." For me, this is one of the high points of Christianity. Rising above hatred has always been seen as a virtue by the wisest of each generation. not only because I see it, but because by it I see everything else. Today, in the land where Jesus was born, was crucified, and was reborn, there is much hatred. who are filled with anger, hate, and a compulsion for vengeance. not something that comes "upon the earth" or "after death." May your Easter be filled with the promise of eternal joy. May your Easter be blessed with the knowledge of salvation. May your Easter be as bright as the eggs in your basket. May your Easter eggs be merry and bright. An "egg"cellent Easter to you. Eggs-perience an egg-citing and egg-cellent Easter. May the Easter Bunny bring you springtime joys and chocolate too. All I really need is love, but a little chocolate now and then doesn't hurt. by Steve Nelson and Jack Rollins - popularized by Gene Autrey. Thank you for visiting these Easter Quotes.